On our way to work this morning, we saw something we’ve never seen before. 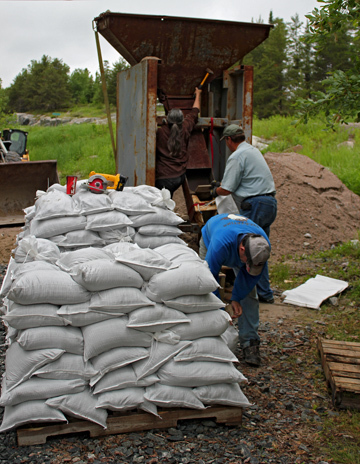 Sandbaggers at work trying to save the house at the bridge we showed you in our last blog. When Elizabeth asked if she could take their picture as they worked, they told her she could if she would help them. She explained that she couldn’t help them with the bagging (she has a very bad back that couldn’t take the weight of the bags), but that she was blogging about the situation and would ask people to come help. These three people are the only people working here. 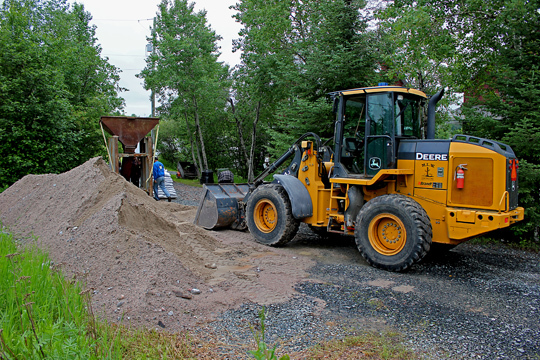 The man who owns MLW Contracting in Keewatin has volunteered his help and equipment. The other two live in the house. They can bag the sand, but while they do that there is no one to place the bags to keep the water away from their house. They have a lot of sand to put into bags, and then they need to move the bags to the shore and place them. Bags weigh about 20 kg each. That’s a lot of hard work for just three people. We had more severe weather yesterday evening, including a rare Tornado Warning, and thunderstorms with the potential to drop high volumes of water are forecast for the next three days. These people need help. If you’re able to volunteer to help with sandbagging properties affected by flood waters, esp. on Darlington Bay in Keewatin, please call 547-2683 to register as a community volunteer. These folks are right by the Darlington Bay Bridge, so if you are passing by and can spare even half an hour to give one or two of them a little rest, please, give them your aid.